Montenegro is a small Southeastern Balkan country on the coast of the Adriatic sea. Montenegro has an area of 13,812 km² (as big as the Bahamas, or Paris) and shares borders with Croatia, Bosnia and Herzegovina, Serbia, Kosovo, and Albania. The mountains of Montenegro include some of the most rugged terrains in Europe, averaging more than 2,000m in elevation. Montenegro is a mountainous country (its name literally means “Black Mountain”), with the Bobotov Kuk standing as the highest peak (2,523 m). Its climate oscillates between Mediterranean and continental according to the elevation. In 1878, the Treaty of Berlin, which fixed the frontiers in the Balkan Peninsula following the Russian victory over the Ottoman empires, defined the limits of Montenegro at the same time it recognised its independence. In 1911, it then joined the Yugoslav Kingdom (then socialist Republic) of which it would remain a part until its demise. After expanding its autonomy to monetary policies and other regal prerogatives, its independence as a sovereign state was voted in a tight referendum in 2006. Montenegro is the third most recent country on the planet. After a period of economic deterioration following the breakdown of Yugoslavia, Montenegro bounced back. Its GDP per capita is about half of the average of the EU. Montenegro is an exporter of metals, wood and banking services, essentially to its Balkan and Italian neighbours. With its newly found independence, Montenegro can and wants to take part in the fight against climate change, for its own good as for its neighbours and the rest of the world. Montenegro describes the evergreen forests that cover its peaks. Forests cover more than 60 % of the total territory and protected areas represent 11% of the territory. Located centrally in Montenegro is Biogradska Gora, a protected area since 1878, which houses one of the last three virgin forests in the world, measuring 1,600 acres. Montenegro is part of the Mediterranean biodiversity hotspot. Its flora-species-to-area ratio is of 0.837, which is the highest in all of Europe. It counts thousands of flora and fauna including large mammals such as bears and wolves. Its high altitude mountains act as a conservatory for species across the Balkans and the Mediterranean. 350 different types of insects and 3 different varieties of trouts are found in the Biogradska Gora forest alone. With the warming of the sea and atmosphere, invasive or displaced species are already impacting the country’s ecological balance and agricultural output. It is estimated that agriculture and tourism, both key sectors of the Montenegrin economy, will be impacted by climate change. Still, Montenegro is committed to mitigating these impacts. Between 20 – 37 % of its energy comes from renewable sources, mainly hydropower. In fact, two installations, a coal power plant and an aluminium factory represent as much as 90% of the country’s total GHG emissions! Montenegro has to build a national and macroeconomic (performance and behaviour of the economy as a whole) vision that encompasses the new challenges of climate change. Its black mountains, evergreen forests and colourful flowers require it from them, and from us. Montenegro is classified as an upper-middle-income country by the World Bank. To get a sense of Montenegro’s position in the fight against climate change, it is vital to observe its history of carbon emissions and exposure to climate risk. The following plots give a historical overview of Montenegro’s CO2 emissions in perspective with global emission levels, as well as the country’s climate action and sustainability performance. This plot combines 3 pieces of information measured from 2007 - 2012: The bar chart indicates the volume of the country’s CO2 emissions, the full line shows the variation of this volume compared to the baseline 2007, and the dotted line presents the same variation, but globally. Carbon dioxide is the main driver of global warming. Between 1990 and 2012, the world’s emissions grew by 14%. Between 2007 and 2008, Montenegro’s emissions increased by 22% before dropping spectacularly by 41% the next year. Montenegro's emissions vary significantly during the observed period due to its economic fluctuations, which altered its energy consumption, economic production and general activity. 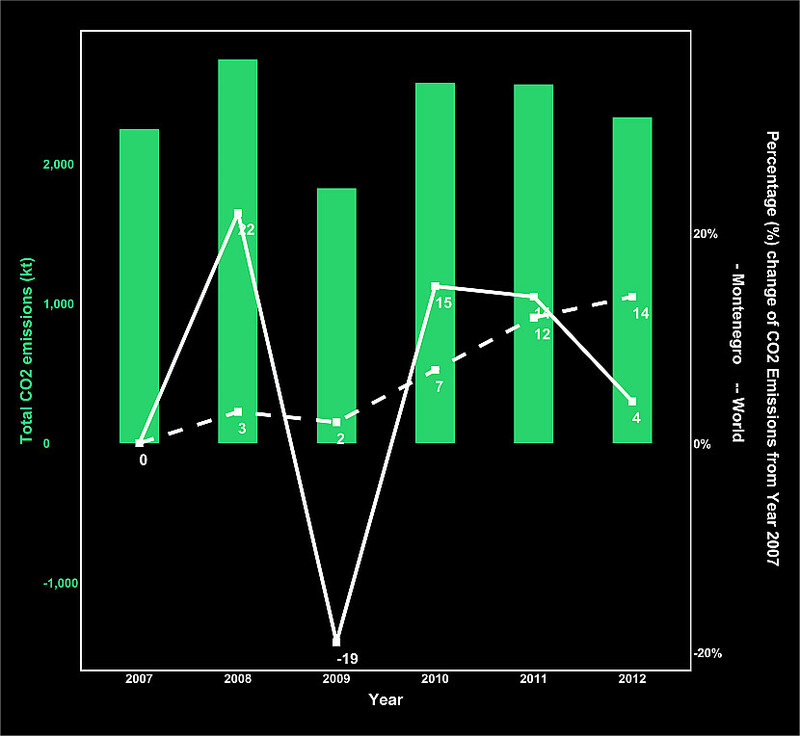 Overall, Montenegro’s GHG emissions have progressed by 4% between 2007 and 2012. The global SDG Index score can be interpreted as the percentage of achievement of the goals. 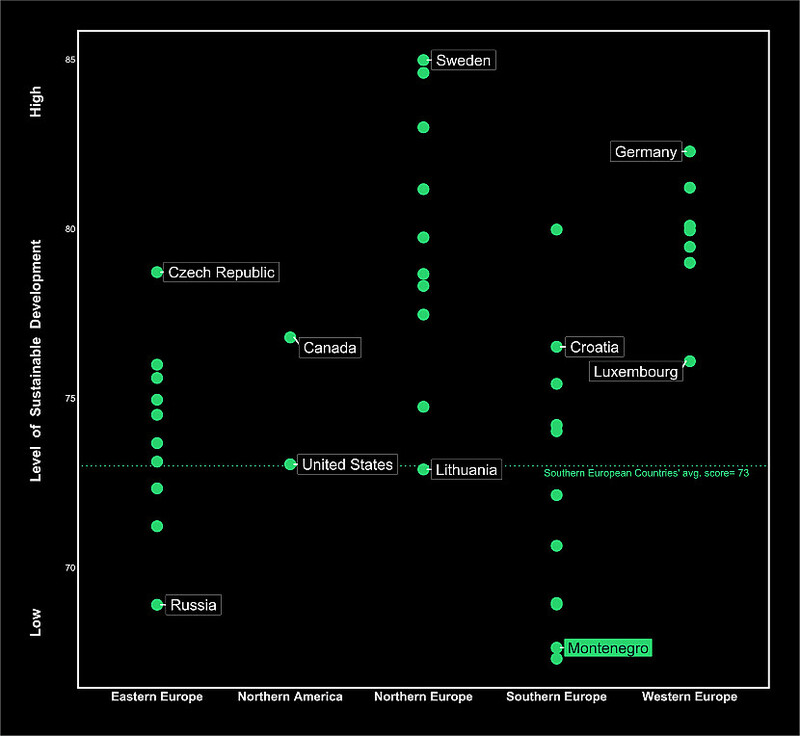 Each dot in the plot represents a country and its score (y-axis). Countries at the bottom score lower on the index as the countries at the top. Sweden currently scores the highest at 85 and the Central African Republic scores lowest at 38.